Each month, we sit down with a Designetics innovator to talk about his or her career, what makes fluid applications systems at Designetics special, and topics relevant to the fluid applications industry. 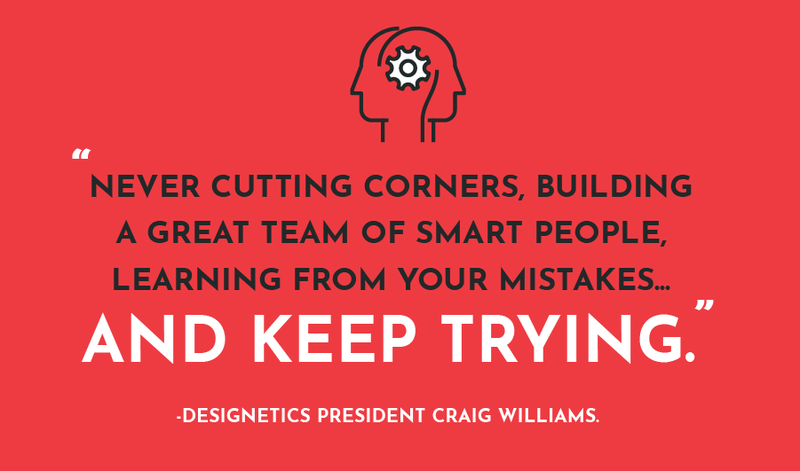 This month: Designetics President Craig Williams. A: Thirty-one years ago, we were asked by the largest glass company in the world to come up with alternative ideas to prime glass, so it could be installed in a vehicle using adhesive instead of mechanical fasteners. Along with the use of adhesives, the industry was exploring alternatives to produce a smoother and more aerodynamic vehicle, which would require a new method for application. At that point in the production process, it was done with little control and a high scrap rate. Things were very messy, slow and lacking repeatability. We offered a new way to control priming and reduce scrap—a closed system to help reduce chemical exposure for the worker. It was a complete shift for production but one that was accepted as new technology at the right time. As we developed our products, I traveled to manufacturing facilities and demoed the applicators. Q: As your career progressed from its beginning to today, what was the one biggest lesson or piece of advice that has guided you? A: Hard work! Certainly, there are many other factors such as never cutting corners, building a great team of smart people, learning from your mistakes…and keep trying. I do believe hard work has taught me many things about myself. I think you learn to keep pressing forward and never say no, ask questions of yourself, focus, learn, change, and most of all just keep trying. Q: What are the biggest challenges facing the fluid application systems industry today? A: Technology is always changing…and we must keep up with innovation in our industry. Cost is a main concern, so we work to make our products cost effective, faster and better. The challenge is learning how to balance high quality while still focusing on controlling cost. We are the best and we have built our business on quality priming. Q: What makes Designetics different than your competitors? A: We are a solutions provider with a focus on customer service and quality. We will not produce a product that is not the best we can make, and we try to do that with cost in mind. We are always working to offer the best customer service, which means providing our customers with honest, fast and accurate answers to their needs. This is what separates us— we care about the success of our customers. We will custom design and make what the customer needs to fit their production requirements. We believe in being a partner the customer can count on for an answer. Q: How does Designetics stay ahead of the competition? A: We try to be innovative in all aspects of our business. That means providing the best product, solving production problems, and providing safe working conditions for everyone involved. Since our inception, we continue to improve and provide innovation with new products. When our sales team is in the field, we look at requirements and changing needs of our customer, with solutions to complete their job as fast as possible, precisely and without scrap. Q: What are the keys to a good partner relationship? A: Designetics builds relationships with honesty, treating others as we would want to be treated. We supply a quality product and stand behind it to ensure the success of our customer. We listen to their needs and continue working on R&D projects to keep up with changes in our customer’s markets. Designetics strives to be a strong partner for our customers, delivering the appropriate fluid application solution for their needs.